Hidden away in a quiet part of the coastal village of Kakanui our bach is the perfect spot for small families or couples alike. 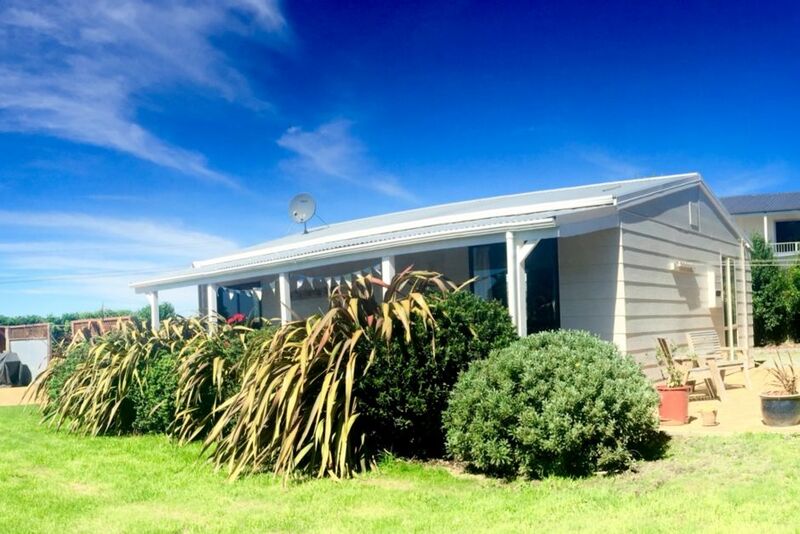 The Hideaway provides a clean, modern and comfortable place to enjoy your Kakanui holiday, we hope you'll enjoy our wee bach as much as we do. The garden and house is child friendly and we have provided some toys and games for the kids to enjoy! There are 2 bedrooms one with a queen size bed and the other has bunks, we can also provide and camp stretcher for an extra $15 per night. Warm and cosy, the heat pump provides quick, clean and efficient heating for the whole bach and there is an electric blanket on the queen bed and wheat bags/hot water bottles are provided for the bunks. We now have gas hot water - no waiting for the boiler to heat up!! The drive provides off road parking with enough room for 2 vehicles. For the those who want the complete holiday experience there is a cleaning service and linen available for hire please enquire for more information and prices. There is a wonderful outdoors area which gets all day sun when you want to sit and relax, the garden is fully fenced and there is a BBQ for you to fire up and enjoy, help yourself to some herbs out of the herb garden and create something delicious! Or head into Oamaru (10 min coastal drive) for a choice of great cafes and restaurants. Head north to check out the award winning Riverstone or south to Moeraki and visit Fleur's Place. In fact you don't have to go very far at all as Kakanui has a fabulous cafe of its own, Coast serves some of the best fish and chips around, eat in or takeaway. In a few minutes you can be strolling along the gorgeous Campbells Bay, swimming, fishing, surfing, whitebaiting or checking out the rock pools. Playing tennis, spotting penguins, seals and even the occasional dolphin, building sandcastles or playing a round of golf! A great place to take some time out, relax and enjoy! Our prices are for a 2 night minimum stay, however if you only want one night a $25 surcharge will be added to the nightly rate. Please note bookings over Easter Weekend are to be a minimum of 4 nights! Why stay at a motel when you can stay here! Great fun for families as it’s very homely with lots of convenient handy things at the Bach like Toys and board games books/dvd’s , tea and coffee sugar and washing powder etc. Location was fantastic. Had a really great time at the beach and exploring Oamaru. And made friends with a cat down the road on our walks down to watch the sunsets. A really cute batch with a lovely sunny outdoor area. Everything we needed for a relaxing weekend away. A charming and cosy retreat! My husband and I just enjoyed a weekend of R&R at The Hideaway and were delighted with the cosy abode. Lorraine was a pleasure to interact with, quick to reply to messages. We appreciated the attention to detail in terms of decor- it enhanced the holiday feel of our weekend away. Thanks Lorraine, we'll be back! We had a lovely time at the Hideaway. The bach is so well set up, it was very warm and cosy and perfect for the three of us. We hope to be back! Lovely smaller cottage which gives a welcome feeling from the moment one enters. Anywhere in Kakanui is near the beach and river but not all have such nice shady grounds. Comfortable cosy warm bach in winter. Close to beach for walks.